Summary and Definition: The Domino Theory related to the spread of Communism and communist rule during the Cold War. The Domino theory speculated that if one region came under the influence of communism, then the surrounding countries would follow in a falling domino effect until the entire region was 'lost' as part of the chain reaction. U.S. President Dwight D. Eisenhower put the theory into words, although he never directly used the term "Domino Theory", when referring to communism in Indochina during a news conference on April 7, 1954. The Domino Theory was shaped and influenced by a range of interrelated domestic and foreign factors and was closely related to US policy of Containment which played and important role during important events of the Cold War and was used as justification for the Korean War and the Vietnam War. 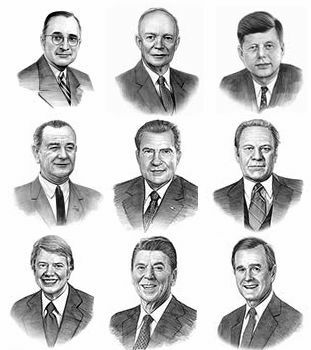 There were nine Presidents who served during the Cold War era between 1945 - 1991. The names of the Cold War Presidents were Harry Truman, Dwight D Eisenhower, John F Kennedy, Lyndon B Johnson, Richard Nixon, Gerald Ford, Jimmy Carter, Ronald Reagan and George H Bush. Many of the Cold War presidents used the Domino Theory as the main justification for their involvement and intervention in the affairs of Eastern Europe, the Middle East, China, Korea, Cuba and Vietnam. The following fact sheet contains interesting information, history and facts on Domino Theory for kids. Domino Theory Facts - 1: The Domino Theory was based on the idea that communism was a contagious force that spread from country to country. It was first advanced during Harry S. Truman's presidency, when WW2 ended, as the United States adopted the policy of Containment to restrict communist expansion and the sphere of influence held by the USSR. Domino Theory Facts - 2: The end of World War 2 saw military forces of the USSR occupying large areas of Eastern Europe and extending their influence over the communist-dominated governments in the 'Satellite Nations' of the Iron Curtain. Domino Theory Facts - 3: The USSR was not content with their power over East Germany, Hungary, Poland, Czechoslovakia, Romania, Bulgaria and Albania, the USSR sought to extend their power and sphere of influence together with communism to other countries in Eastern Europe and even to the Middle East. Domino Theory Facts - 4: The Domino Theory was debated in the US during the Iran crisis of 1946 when the Soviets remained in Northern Iran after WW2 instead of withdrawing. The Soviets demanded access to Iran's oil supplies and began to help Communists in Northern Iran to set up a separate government. Domino Theory Facts - 5: The USSR also sought to extend their influence to Greece and Turkey giving further credence to the Domino Theory. Greece was in a weak position after WW2 and the Greek Civil War (1946–1949) had broken out as Communist rebels attempted to take over the country. Domino Theory Facts - 6: Turkey was also a prime Soviet target as the country became involved in the Turkish Straits crisis in 1946. Whoever controlled the Turkish straits, which connected the Black Sea to the Mediterranean Sea, had entry or exit points for naval forces to travel to and from the Black Sea. Domino Theory Facts - 7: President Truman and General George Marshall, the United States Secretary of State, were early proponents of the Domino Theory. It was this belief together with the US policy of Containment that led to the Truman Doctrine and the Marshall Plan. Both Turkey and Greece had turned to the US for help and on March 27, 1947 President Harry S. Truman had made a speech asking Congress to support the Greek Government with economic and military aid against the Communists and also to provide assistance for Turkey to help them resist the communist aggression. The following fact sheet continues with interesting information, history and facts on Domino Theory for kids. Domino Theory Facts - 8: The withdrawal of Japan at the end of WW2 had left the Malayan economy in crisis. The Malayan Emergency (16 June 1948 – 12 July 1960) was a Malayan guerrilla war fought between British Commonwealth armed forces and the military arm of the Malayan Communist Party. The Domino Theory was given credence on 8 September 1955, the Government of the Federation of Malaya issued a declaration of amnesty to the communists. Domino Theory Facts - 9: NATO, the North Atlantic Treaty Organization, was formed on April 4, 1949 to establish a mutual defense pact aimed at containing Soviet aggression and blocking USSR expansion into Europe. The establishment of NATO gave further credence to the Domino Theory. Domino Theory Facts - 10: The Domino Theory once again came into play as the world witnessed the rise in power of Mao Zedong and Communism in China. The conflict involving the US-backed forces of Chiang Kai-shek against the Communists resulted in the spread of Communism into East Asia. Domino Theory Facts - 11: In 1950 China entered the Korean War (June 25, 1950 - July 27, 1953) and the US joined the conflict to defend South Korea from the communist invasion. Domino Theory Facts - 12: On 7 May 1954, the Viet Minh, a Communist army, defeated French troops in the Battle of Dien Bien Phu and took control of what became North Vietnam. In line with the US policy of Containment, and aware of the Domino Theory, President Dwight D. Eisenhower had sent previously sent aid to the French forces fighting the Communist guerillas in Vietnam. The French defeat at Dien Bien Phu ended the French effort to retain Vietnam, Cambodia and Laos in the Indochina War but began the direct involvement of the US to fight against communism in the Vietnam War (November 1, 1955 – April 30, 1975). Domino Theory Facts - 13: President Eisenhower had reasoned that if Communists succeeded in taking over the rest of Indochina that the Communists would gain the momentum to take over Burma, Thailand, Malaya and Indonesia. Domino Theory Facts - 14: President Eisenhower was the first to speak publicly about the "Domino Theory" when he spoke about the importance of preventing communism's rise in Indochina. There were considerable fears that Japan, the Philippines, Taiwan and even New Zealand and Australia could be forced to compromise politically with communism. Domino Theory Facts - 15: The Vietnam War dragged on and examples of US Presidents beliefs in the Domino Theory were evident in the following public statements. President John F. Kennedy made a public statement on 2 September 2, 1963 stating "If we withdrew from Vietnam. the Communists would control Vietnam. Pretty soon Thailand. Cambodia. Laos. Malaya would go". Domino Theory Facts - 16: On August 2, 1965 President Lyndon B. Johnson used the Domino Theory to justify the escalation of the U.S. military presence in Vietnam stated "If this little nation goes down the drain and can't maintain her independence, ask yourself. what's going to happen to all the other little nations?" Domino Theory Facts - 17: The Domino Theory provided a succession of US Presidents with a simple, believable justification for their actions in the Korean War and the Vietnam War. The speculations of the Domino theory and the US Containment policy resulted in the Vietnam War and arguably led to the Philippines, Indonesia, Malaysia, Singapore and Thailand staying free of Communism.